The most common type of pain in the fatty tissue of the low back is the tender fatty nodule in the SI area, some times called the episa-croiliac lipoma or "Back mouse".Although it has been speculated that some fatty tissue may herniate through the normal deep fascia and become edematous and the source of pain, the significance of these nodules is highly disputed. clinically the patent may complain of pain in the tender nodules, which are palpable and often bilateral. The "mass" is usually palpable as a mobile soft tumor that splis beneath the examining finger. the treatment ranges from ignoring the lesion as insignificant to multiple puncturing and injection of the nodule with local anethetic, followed by massage. surgical removal does not seem justified because of the uncertainty regarding the significance of these lipoma. A less common area of pain is the normal presacral fat pad. 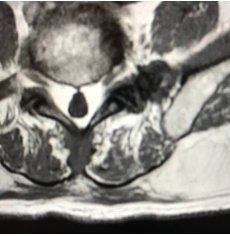 The patient is most often female, and the pain may be related to the menstural cycle. There may even be complaints of a sanse of "swelling" in the area, although none is usually present on examination. Most likely, pain in this normal fat pad is referred from elsewhere, but the cause remains obscure. Other terms for the episacral lipoma are the back mouse, iliac crest pain syndrome and multifidus triangle syndrome. They usually occur just under the skin but occasionally may be deeper. Inherited conditions can bring them on. Some people who have a rare condition known as Madelung’s disease can get them. This most often affects alcoholic men of Mediterranean ancestry.They usually appear as small, soft lumps. They’re usually less than 2 inches wide. Sometimes, more than one will develop. 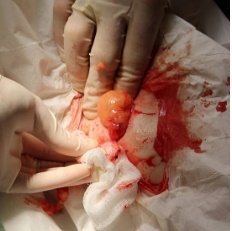 2.tissue biopsy is used to confirm the diagnosis. 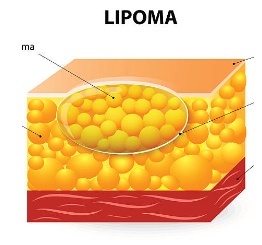 Since lipomas aren’t harmful, many times doctor will leave them alone. You may be asked to keep an eye on it between visits. If one hurts doctor can take it out surgically with a small cut. the muscle and lower limb movement reeducation in a chronic case whether the movements might had been limited due to pain for a long period. Manipulations should be my means of treatment for pain relief. Electrical stimulation was performed in a "surrounding" distribution, with the lipoma in the center of a circle of points. Create an ointment using natural oils and herbs. Natural oils such as neem and flaxseed make excellent base for ointments. Experiment with different combinations of herbs and oils. Neem oil is an astringent that helps protect your skin. It is commonly used in Ayurvedic (ancient Indian) medicine to treat lipomas. Flaxseed oil has high levels of omega-3 and omega-6 fatty acids. Omega-3 and omega-6 fatty acids help to reduce inflammation. Be sure to buy flaxseed oil certified to be free of heavy metals, such as lead and mercury. While not a natural oil, cooled green tea is a great alternative for your base. It is high in antioxidants that help regulate blood sugar and blood fats. 2. Mix chickweed with a natural oil or tea base. Blend 1 teaspoon of chickweed to 2-3 tablespoons of neem oil or flaxseed oil. Apply the salve to the lipoma. You can also use 1-2 tablespoons of cooled green tea instead of neem or flaxseed oil to make a paste. 3. Try creating an ointment with turmeric. Put 1 teaspoon of turmeric together with 2-3 tablespoons of neem oil or flaxseed oil. Smooth the ointment onto the lipoma. Your skin will turn a bit orange or yellow because of the turmeric. Cover the lipoma with a bandage to protect your clothes. Turmeric, like neem oil, is commonly used in Ayurvedic medicine. For a paste, add 1-2 tablespoons of cooled green tea instead of neem or flaxseed oil to the turmeric. 4. Add dried sage to neem oil or flaxseed oil. Mix ½ to 1 teaspoon of dried sage with 2-3 tablespoons of neem oil or flaxseed oil. Coat the lipoma with the balm. Substitute 1-2 tablespoons of cooled green tea for neem or flaxseed oil to make a paste. Sage is used in traditional Chinese medicine to dissolve fatty tissue. Switch to organic foods as much as possible. Switching to organic foods reduces the number of preservatives and additives you eat. Your liver will then be able to focus on removing the toxins stored in the lipoma’s fatty tissue. Limiting the amount of processed and pre-packaged food you eat will also limit the amount of additives and preservatives you eat. 2. Increase the amount of vegetables and fruits in your diet. Fruits and vegetables have antioxidants which help lower fats in the blood. Choose brightly colored fruits and vegetables for the highest level of antioxidants. Some great examples of fruits and vegetables high in antioxidants are blueberries, raspberries, apples, plums, citrus fruits, leafy green vegetables, squash and bell peppers. 3. Eat more fish. Fish has good amounts of healthy omega-3 fats and good quality protein. Omega-3 fats help to decrease inflammation and may help limit the growth of lipomas. Salmon and tuna are excellent sources of omega-3 fatty acids as well as high in protein. 4. Limit eating red meats. If you do eat red meat, make sure it is grass-fed with no added antibiotics or hormones. Grass-fed meat has a lot of healthy omega-3 and omega-6 fats. Chicken, tofu, and beans are all healthy alternatives to red meat that are also high in protein.